On Facebook more than 350 million images are uploaded each day. On Snapchat 8,796 images are uploaded per second. It has been estimated that over 3.2 billion images are uploaded to social media sites each day! Every day millions of audio and video files are being downloaded. When data is transmitted across the Internet, it will go through many different physical links between routers. The connection from a computer or a LAN into the Internet is likely to be the slowest part of this route, as you probably know from experience. At home you may have quite a slow network connection and it may take a while for web pages to load. One way of speeding the rate at which files can be transmitted across the Internet is to compress them to make them smaller. Smaller files take less time to transmit over a network. Understanding how compression affects files is important, as the type of compression selected will affect how the image looks or the audio track sounds. The final use of the file will dictate how much you can compress the files and still have a file that is uasable. Reduce the amount of storage needed on a computer to save files. Allow large files to be transmitted as an email attachment; many email servers limit the size of a file that can be sent and compression can reduce the file size to allow users to send it. Allow a file to be transmitted in less time, due to the smaller file size. It reduces congestion on the Internet through smaller files. It makes audio and video files suitable for streaming. Is a data encoding method where files are compressed by removing some of the detail. For example, photographs can be stored using fewer colours so fewer bits are needed per pixel. This type of compression is used to compress images, audio and video files. That is why it cannot be used for text files or program files - A book with many missing words would be unreadable! But lossy compression can be used for graphic and audio files as they contain much data that can be discarded. The most commonly used compression technique for graphic files was developed by the Joint Photographic Experts Group and produces JPEG files with the extension .jpg. With a lossless data encoding method, a file is compressed but no data is lost and the file can be decompressed with all of its information intact. For example, bank records must keep all of the data; you cannot transmit a bank statment and miss out a few zeros because they don't matter too much! It could be used to compress data files, for example by Zipping them using a utility program such as WinZip, before attaching them to an email. Finish completing the following table showing different file types and file extensions used for different file formats. data having the same value and are stored using requency/data pairs. This repeating string, called a run, is encoded into two bytes. 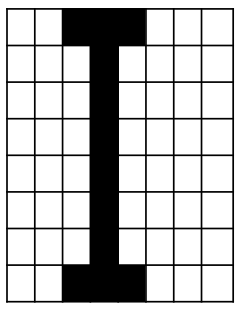 The first byte represents the number of characters in the run and the second gives the character. This string length is 18 bytes. This string has been reduced to 6 bytes using RLE. When represented by a letter, the size of the file is 64 bytes: 8 bytes per line. Using Run Length Encoding will reduce the file size of this one character from 64 bytes to 48 bytes. Huffman coding, also known as Huffman Encoding or Huffman Compression. Is an algorithm for lossless compression based on the frequency of the characters or symbols in the file. It ensures that the more common characters have fewer bits to represent them than the less common characters that need more bits to identify them. Therefore the overall size of the file is reduced. It is therefore called a variable-length coding system because the codes for different characters have different lengths. For this example we will construct a Huffman Tree for the sentence: BOURNE_GRAMMAR. Step 1: Draw a table showing the frequency of each character, including spaces. For example, there is one "B", one "E" and three "R"s in the sentence. (Check that the frequencies add up to 14 characters including spaces as in the given sentence.) Ensure that you write the frequencies in ascending order as shown above. Currently the total bit value for the uncompressed sentence is 14 chars x 7-bits = 98 bits. Step 1: Combine pairs of frequencies, always choosing the pair that gives the smallest combined frequency. For example, B and E each have a frequency of 1. So B and E have a combined frequency of 2. Create a node containing the combined frequencies of the first two pairs (2) and a branch for each of B and E.
Step 2: The next smallest frequency pair is formed by pairing the letters are G and N each also have a frequency of 1. These can then be grouped to form a new node with a value of 4. 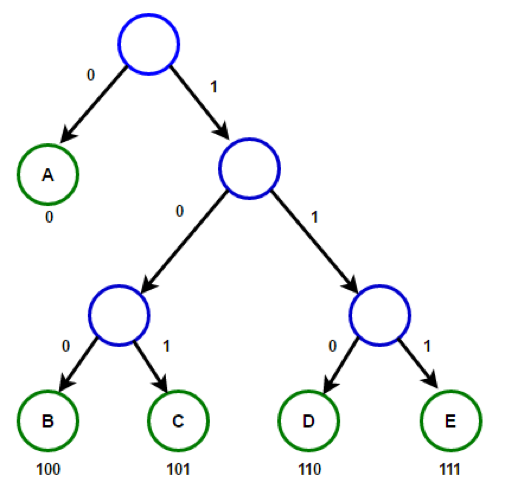 Step 3: We have a choice when placing U and SPACE, it can be paired with the previous subtree or a new subtree. To keep the tree balanced we will create a new subtree with a frequency value of 2. Step 4: The next two frequency pairs are O and A, having a frequency of 1 and 2. 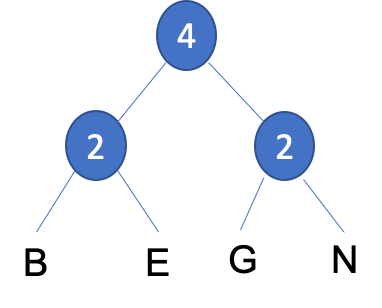 These can then be grouped to form a subtree with a value of 3, which can then be grouped together with the previous subtree to form a new node with a value of 5. 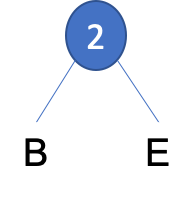 Step 5: We have another choice when placing M which has a frequency value of 2, it can be paired with either of the two subtrees or a new node. To keep the tree balanced we will create a new node with a new frequency value of 7. Step 6: We have another choice when placing R which has a frequency value of 3, it can be paired with either of the two subtrees or a new node. To keep the tree balanced we will create a new node with a new frequency value of 7. 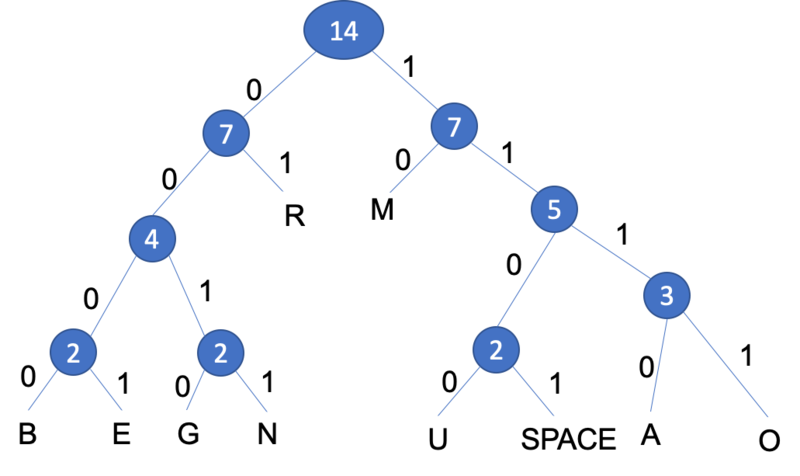 Step 7: We need to add a root node to join the two subtrees together. Step 8: The tree is now complete. You can add the labels below to each branch, with the left branches labelled 0 and the right branches labelled 1.
root node to the character. 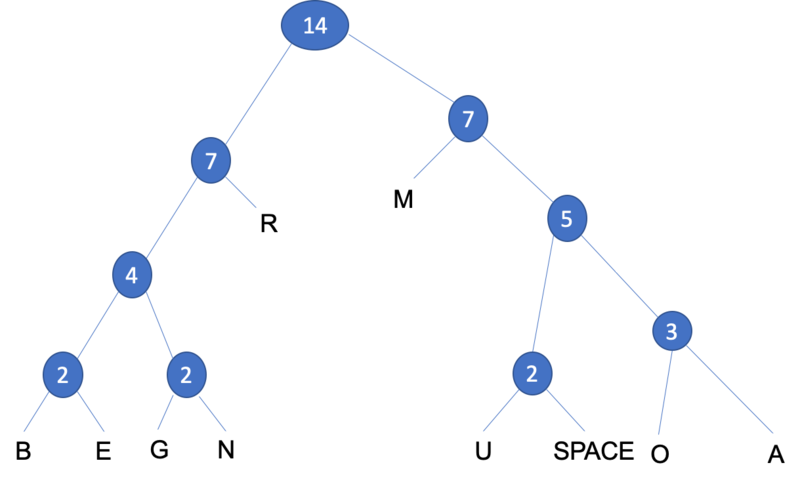 Branching left at a node is coded 0, branching right is coded 1.
require fewer characters to encode them. of the tree, you go left, then right to reach 'R'. The encoding for 'G' would be 0010 and for 'B', 0000. 14 chars x 7-bits = 98 bits using 7-bit ASCII. saving of 52 bits in the compressed format, with a 53% reduction in size. We can reassemble our sentence with the Huffman Encoded binary values below each character, counting the number of bits gives us 46 bits compared to the original 98 bits that's a reduction of 53%. (a) The result of applying a run length encoding algorithm. (b) The original file size and size after appplying run length encoding. 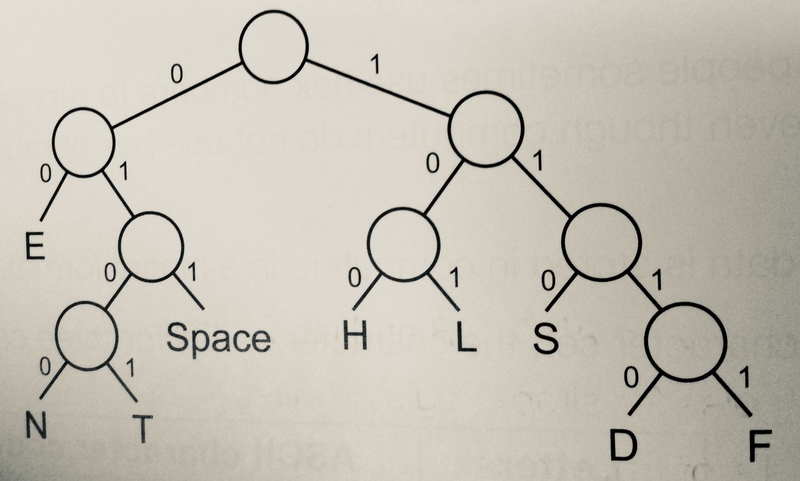 (a) Complete the table showing the Huffman coding for S, T and SPACE. (b) What does the following code represent? Platinum: Using the Huffman code sentence 'HELEN FEEDS THE EELS' which can be stored in 57 bits. (a) Calculate the number of bits that would be needed to store the sentence in ASCII? (b) Create a Huffman Tree for this set of characters.